image to view it large in a new window. If you ever go into the woods with John, and if he suddenly jumps back and says "Uh oh," then you should duck for cover. He is the most knowledgeable naturalist I have ever met. If he is surprised in the woods, it is a bad surprise. We were hiking in the Mt Kearsarge forest behind the town dump and up the hill. I was photographing yellow club fungus. John was walking the area, talking to me, saying how he had never seen so many porcupine quills in one area. He was exploring outside of a porcupine den. He identified the entrances of it and was observing the tracks and surrounding vegetation — seeing what the porcupine was eating nearby. He again looked at the glacial erratic boulder that was 15 feet tall under which the porcupine had her den. And that is when he cursed and jumped backward. The porcupine had been right there all the time, watching him nervously, camouflaged by her coat which was the color of the quartz flecked granite boulder. 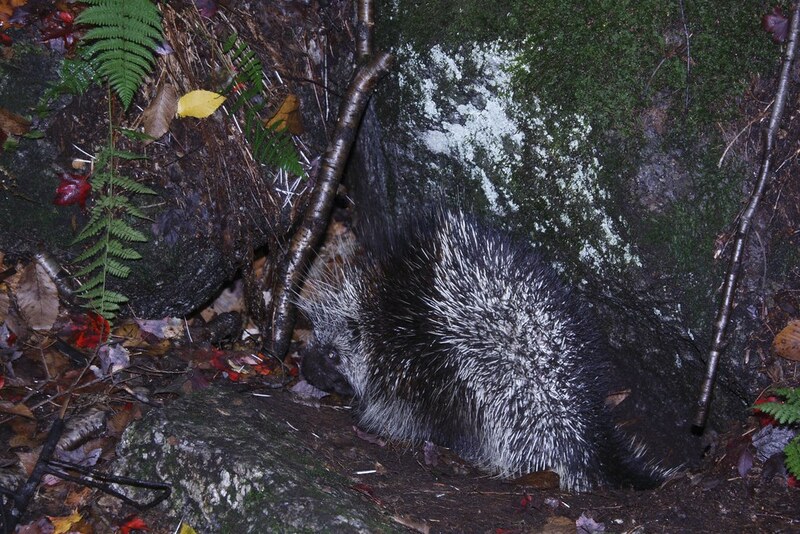 Once we caught our breath, John observed that porcupines were usually placid and calm. This one was very tense and nervous. She was not behaving normally. John feared other predators — perhaps something was still in the area. The quills littering the forest floor were both baby and adult quills. The mother porcupine was alone. There was evidence of struggle in the vegetation. After studying the tracks, trails and clues, John told me that a fisher cat, the only natural predator of porcupines, had raided the den and carried off and killed the porcupine pup. The mother had defended her baby valiantly but she couldn't withstand a fisher cat attack. She was now alone and nervous. John climbed all the way to the top of the boulder to find another view of the mom. This spooked her out of the den, which is when I got two shots of her. We left her in relative peace and followed the fisher cat trail. We soon lost the trail. The fisher could have gone up a tree to eat its prey. You can see photos of her den and habitat in the slide show below. I know it's nature, but that poor porcupine...no wonder she was stressed. Your story makes me miss wilderness. I've never seen a porcupine in the wild but I did get a quill in my knee once. Not fun to remove. Lucky you for seeing her. It is a sad tale though.